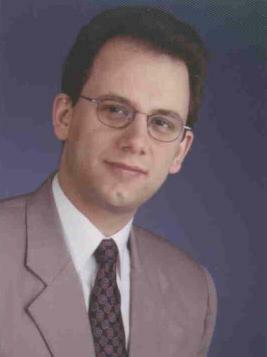 1994-2000: I studied computer science at the "Rheinische Friedrich-Wilhelms-Universität" in Bonn, with 2nd course in mathematics. I wrote my diploma thesis "Uhrensynchronisation in einem lokalen Funknetzwerk" (clock synchronization in a wireless LAN) while being part of the group CAS (cooperative autonomous systems) of the autonomous intelligent systems (AiS) institute of the GMD - german national research center for information technology in Birlinghoven. April 2000-September 2006: I was part of the group real-time systems and communication (EuK) of the institute for distributed systems (IVS) of the Otto-von-Guericke-Universität Magdeburg as an assistant lecturer. October 2006-September 2011: I was part of the group Industrial Communication System at the Institut für Automation und Kommunikation (ifak) e.V. with focus on Wireless Industrial Communication. October 2011-March 2015: I'm at jSERVICE GmbH, working as a Consulter for Human-Machine-Interfaces (HMI) in automotive systems. Since April 2015: I'm at IAV GmbH Ingenieurgesellschaft Auto und Verkehr, working as a Consulter for Human-Machine-Interfaces (HMI) in automotive systems. Informationssicherheit in flexiblen Automatisierungsanlagen mit hohen Echtzeitanforderungen. In: Tagungsband 9. Magdeburger Maschinenbautage, Magdeburg, Germany, September 30-October 1, 2009, pp. 361-370. Marko Krätzig, Lutz Rauchhaupt, André Schimschar, Spiro Trikaliotis. 16-Channel-Analyser for parallel IEEE 802.15.4 Monitoring. In: Proceedings of the 14th IEEE International Conference on Emerging Technologies and Factory Automation (ETFA), Palma de Mallorca, Spain, September 22-26, 2009. Mapping WirelessHART into PROFINET and PROFIBUS fieldbusses. Spiro Trikaliotis, Lutz Rauchhaupt, Marko Krätzig. Wireless Automation - Test of Applicability. André Gnad, Marko Krätzig, Lutz Rauchhaupt, Spiro Trikaliotis. Relevant Influences in Wireless Automation. Spiro Trikaliotis, Lars Lindemann, Axel Pöschmann. In: Entwurf komplexer Automatisierungssysteme (EKA), Magdeburg, Germany, April 16-17, 2008, pp. 61-70. Verkehrssteuerung im WLAN. Quality of Service in Funknetzen. Industriefunk. WLAN und Co. im Industrieeinsatz. iX Magazin für professionelle Informationstechnik, 12/2007, pp. 120-125. Evaluating a Clock Synchronization Protocol for Dependable Sensor Networks. In: Proceedings of the 20th IEEE International Parallel & Distributed Processing Symposium (IPDPS 2006), 11th IEEE Workshop on Dependable Parallel, Distributed and Network-Centric Systems (DPDNS 2006), Rhodes Island, Greece, April 25-29, 2006, p. 345 (abstract, papers available only on accompaniing CD). Utilizing a fault-tolerance protocol for colocating interfering cells in a wireless network. In: Workshop Proceedings "Dependability and Fault-Tolerance", Organic and Pervasive Computing, International Conference on Architecture of Computing Systems (ARCS 2006), Frankfurt, Germany, March 13-16, 2006, pp. 106-115. Maschenfunk. Gemeinsamkeiten und Unterschiede von WLAN und Mesh-Netzen. c't Magazin für Computertechnik, 02/2006, pp. 198-203. Drängler im WLAN. Bandbreitenklau in Funknetzen..
WLAN-Feinschliff. Schnelleres Funknetz mit stabilerem Durchsatz. c't Magazin für Computertechnik, 06/2004, pp. 216-221. Utilizing Fault-Tolerance for Achieving QoS in Ad-hoc Networks. Workshop Proceedings "Dependability and Fault-Tolerance", Organic and Pervasive Computing, International Conference on Architecture of Computing Systems (ARCS 2004), Augsburg, Germany, March 23-26, 2004, pp. 66-75. Vorfahrt für die Schnellen. Sendezeitzuteilung bei WLANs und ihre ererbten Probleme. c't Magazin für Computertechnik, 18/2003, pp. 208-213. Performanz eines WLAN-Gruppenkommunikationsprotokolls bei Störungen durch Bluetooth. In: Workshop Proceedings "Dependability and Fault-Tolerance", Trends in Network and Pervasive Computing, International Conference on Architecture of Computing Systems (ARCS 2002), Karlsruhe, Germany, April 8-12, 2002, pp. 47-53. Messung der gegenseitigen Störung von Funk-Netzwerken nach den Standards IEEE 802.11b und IEEE 802.15 ("Bluetooth"). Talk: GI Fachgruppe Betriebssysteme, Herbsttreffen 2001, Ilmenau, Germany, 15./16. November 2001. M. Gergeleit, E. Nett, S. Trikaliotis. Diskussionskreis "Fehlertoleranz" of the GI/VDE-ITG Fachgruppe "Fehlertolerierende Systeme". 23. November 2001, FhG/GMD, St. Augustin. Die Jahrestagung der GI in Wien: Informatik 2001, 25. bis 28. September 2001, Wien, Österreich, pp. 523-529. M. Mock, R. Frings, E. Nett, S. Trikaliotis. Continuous Clock Synchronization in Wireless Real-Time Applikations. 19th IEEE Symposium on Reliable Distributed Systems 2000, 16-18 October 2000, Nürnberg, Germany, pp. 125-132. Clock Synchronization for Wireless Local Area Networks. Proceedings of the 12th Euromicro Conference On Real Time Systems, 19-21 June 2000, Stockholm, Schweden, pp. 183-189. My diploma thesis: Uhrensynchronisation in einem lokalen Funknetzwerk (clock synchronization in a wireless LAN) is also available in the GMD research series (full text here). My hobbies include (but are not limited to) Handball, computers, electronics. 7. Interested in more information? Feel free to contact me: www-201903@spiro.trikaliotis.net. © 1998-2019 Spiro Trikaliotis, PGP Key.